JEFFREY C. TAYLOR is a Morristown native. Jeff has been practicing law since 1988. 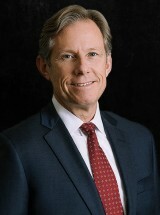 His practice areas include preventative counseling and litigation in labor law, employment law, workplace harassment and discrimination, workers' compensation injuries, wage and hour, wrongful discharge, unemployment compensation, ADAAA, FMLA compliance, negligence law, union avoidance, management and supervisory training, Tennessee Drug Free Workplace Act, mediation, and business law. Member: Hamblen County, Tennessee and American Bar Associations. Jeff's community activities include Hamblen County Bar Association, 1988 - 2016 President (2005); 2005 - 2016 SunTrust Bank, Advisory Board of Directors; 2004-2016 Board of Directors, East Tennessee State University National Alumni Association, 2004 - 2016 President 2013-2016; 2003-2015 Board of Directors, Kingswood School, Inc., 2011-2014 Chairman of Board; 2015 - 2016 Cournterstone Academy, Board of Directors; 2003-2005, 2013 Board of Directors for Morristown Area Chamber of Commerce; 2003 Professional Division Chair - Hamblen County United Way; 2003-Vice President Leadership Division, Morristown Area Chamber of Commerce; Kiwanis Club of Morristown; 1992-2016; Board of Directors, Rose Center Counsel for the Arts, 1992 - 1997 Chairman; Advisor, Boy Scouts of American - Explorer Division 1992.